Reporters and honest opinion writers have a special challenge in dealing with the Trump administration and, more broadly, authoritarian far-right movements worldwide. After the hyper-partisan yellow journalism era of the early 20th century, the profession tried to establish a firm “view from nowhere” approach. The rules were fairly simple: report only the basic facts and the competing perspectives; don’t show any more preference for one side of an argument over the other; don’t allow journalists to openly have political opinions; and studiously avoid catering to–or offending–any specific audience. At first glance, there is a sort of comfort in this cold, professionally scientistic approach. After all, who wants biased news? Certainly in most people’s experience, the full assemblage of facts must favor each side almost equally, leaving it up to the reader to determine who is more right on balance. Interestingly, though, this move toward pure objectivity was at odds with the prevailing trend in academic humanities at the time, which was led overwhelmingly by thinkers who believed there was no such thing as objectivity. They argued that everyone has a biased perspective, and that honesty is best practiced when people are radically transparent about their implicit viewpoints. Capitalism itself also put pressure on the new journalistic consensus: the explosion of media sources, exacerbated by social media silos and combined with the technology-driven disruption of existing revenue streams to segment news consumers, consistently tempted editors to tailor increasingly sensationalist headlines to ever more targeted audiences. Right-wing media outlets deftly exploited these trends. Rupert Murdoch, and those who followed in his footsteps, adopted the superficial norms of the objective press while delivering a steady stream of propaganda to the most gullible, hateful, and fearful populations. They forced straight journalists to either stand in direct opposition–and thus open themselves to accusation of bias–or pretend that their “colleagues” at these conservative organizations were doing legitimate work. And then, of course, came the right-wing demagogues: leaders like Trump, who were not only purveyors but eager consumers of this propaganda, and people for whom objective truth was irrelevant if the story sounded good and confirmed the prevailing worldviews of their audience. Outright lying about easily established facts became ubiquitous. So, what can be done about this? Some have tried hard to cling onto the ideal of pure objectivity. But the problem is that no one believes in pure objectivity anymore. More importantly, trying to maintain a detached objectivity to when one side is telling the truth and the other is abjectly lying is itself an unbalanced perspective that harms the audience and the world at large. We at the Washington Monthly have taken a different approach. We don’t hide our perspective or feign objectivity. We tell you where we’re coming from, and we do our best to present the objective truth as best as we understand it, whether through fresh analysis on our website or long-form pieces in the print magazine that offer new ideas to big problems. We do not pretend that monsters are not monsters. We call them out, and we always give a voice to the victims of oppression and exploitation. This may not please all sides, but it is the surest path toward helping our readers make sense of the world, grappling with hard truths and unflinching realities. To that end, we also don’t engage in clickbait to drive ad revenue; we expect that honesty will be its own reward. But that means we can’t count on massive ad revenues to keep the lights on. We don’t hide our content behind paywalls, so we need all of you who value our approach to help us sustain the kind of journalism this country so desperately needs. If you believe in our mission, and that we have a vital role to play in helping fight the global surge of neo-fascism, please consider making a donation during this month’s fundraising drive. Whatever you can give—be it $10, $50, $100 or more—will be matched, dollar for dollar, thanks to a generous challenge grant we’ve received from NewsMatch. 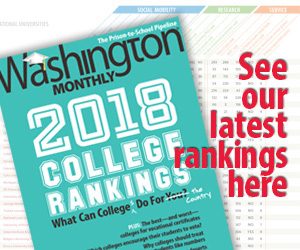 Plus, for a donation of $50 or more, you’ll receive a free one-year subscription to the crisp, easy-on-the-eyes print edition of the Washington Monthly. And of course, your contributions are totally tax deductible. Please help us if you can. It will go a long way toward furthering the reality-based journalism and fierce opinion you’ve come to expect.